1Department of Pharmacognosy, & 5Department of Pharmacology Captain Srinivasa Murthy Regional Ayurveda Drug Development Institute, CCRAS, Govt. of India, Arumbakkam, Chennai – 600 106, Tamil Nadu, INDIA. 2Department of Pharmacology, Sri Ramachandra College of Pharmacy, Sri Ramachandra University, Porur, Chennai - 600116, Tamil Nadu, INDIA. 3Department of Pharm. Analysis, C.L.Baid Metha College of Pharmacy, Thoraipakkam, Chennai – 600 097, Tamil Nadu, INDIA. 4Department of Chemistry, Govt. Arts College, Ariyalur - 621 713, Tamil Nadu, INDIA. Context: The stem barks of the plant Symplocos crataegoides Buch.-Ham. ex D. Don (syn. Symplocos paniculata (Thunb.) Miq. ), Fam. Symplocaceae is extensively used in Indian medicine under the names of Lodhra/Patikalodhra. Mainly it is used to cure uterine complaints, vaginal and menstrual disorders. Aim: To investigate the phytochemicals from the n-hexane extract of the stem bark of Symplocos crataegoides Buch.-Ham. ex D. Don., using GC-MS analysis. Materials and Methods: Stem bark of S.crataegoides was extracted by Soxhlet extraction method using n-hexane. The extract was injected by splitless injection mode into the GC MS 5975 C Agilent equipped with a QP- 5000 (quadrupole) Gas Chromatography - Mass Spectrometer. Results: Identification of 57 compounds from n-hexane extract. Those compounds were identified by close matches with standard MS spectra and compared with NIST - 11 and WILEY library data. Undecane (7.51%) was found as major compound followed by Isopropyl myristate, Dodecane, 1,2,4-trimethyl-benzene, Octacosane, 2-methyl-decane, 2-ethyl-1,2-dimethyl-benzene, 1,2,3,5- tetramethyl-benzene etc., other constituents were found to be in traceable quantities. Conclusion: GC-MS analysis of S. crataegoides revealed certain interesting facts of presentation of various phytoconstituents in the stem bark. The presence of various phytoconstituents contributes to the medicinal activity of the plant. 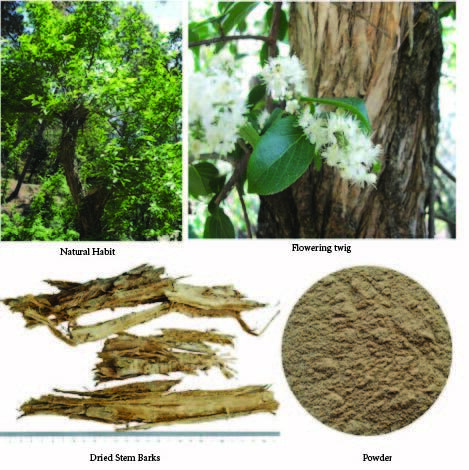 Govindarajan N, Cheekala UM, Arcot S, Sundaramoorthy S, Duraisamy R, Raju I. GC-MS Analysis of n-hexane Extract of Stem Bark of Symplocos crataegoides Buch.-Ham. ex D. Don. Pharmacognosy Journal. 2016;8(6):520-524.